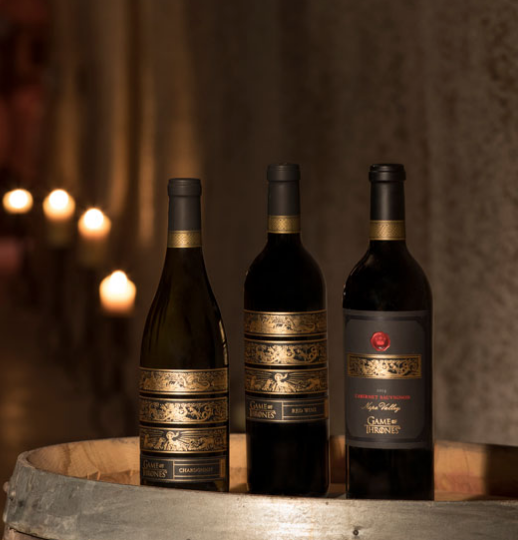 There are celebrity wines aplenty ... and then there's "The Game of Thrones" collection. From the arid climate of Dorne to the lush vineyards of The Reach, the topography of the Seven Kingdoms of Westeros is as diverse as the wine we produce. Against the backdrop of the ever evolving struggle for the Iron Throne and amidst the howling winds of winter, nobles raise their glasses and toast to luck in the wars to come. Vintage Wine Estates have announced via press release, the latest in their line of Game of Thrones-themed wines, a Pinot Noir. "Now you and your friends", it says, "can sit around sipping wine and playing games just like Tyrion and company."